An unmissable excursion revealing the best that the city of Hamada has to offer: enchanting sea views from an idyllic beach, a large aquarium famous for its playful beluga whales, a delicious lunch at a restaurant and a mystical Shinto sanctuary where we can watch a fascinating traditional dance show. Our excursion to Hamada begins with a visit to Iwami Tatamigaura beach, a large rocky shore formed by the emergence of the sea bed after an earthquake. We will stroll along the beach where it is not uncommon to stumble across fossil remains, and we can take in the beautiful sea views. The next stop is AQUAS Aquarium, where we can view over 10,000 sea creatures from 400 different species. We will be enchanted as we stand before the aquarium’s main attraction, the beluga whale tank. With a bit of luck we can see the intriguing show put on by these wonderful white whales as they produce ring-shaped bubbles of water from their mouths or blowholes. After such an interesting and engaging visit, we will enjoy a lavish restaurant lunch of typical local dishes. In the afternoon, we will head to the Sanku shrine, made up of three temples dedicated to three Shinto deities, the ancient religion practised in Japan. 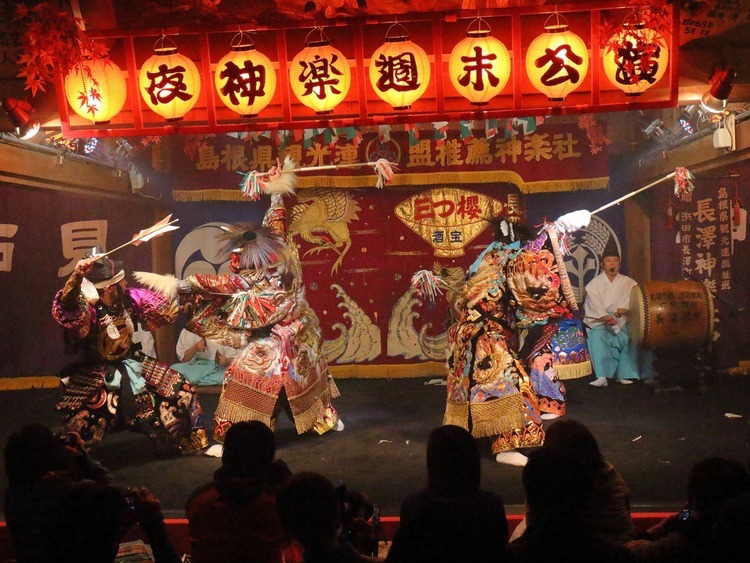 Inside the temple, we will have the chance to watch an Iwami Kagura show, the oldest traditional Japanese dance, characterised by splendid costumes, vivid masks and a lively rhythm that sets the stage for divinity and demons. It is quite easy to follow thanks to the miming of the dancers and the visual and sound effects. A once-in-a-lifetime opportunity to see Japan’s rich cultural heritage up close! There is limited availability of guides that speak English and other European languages.